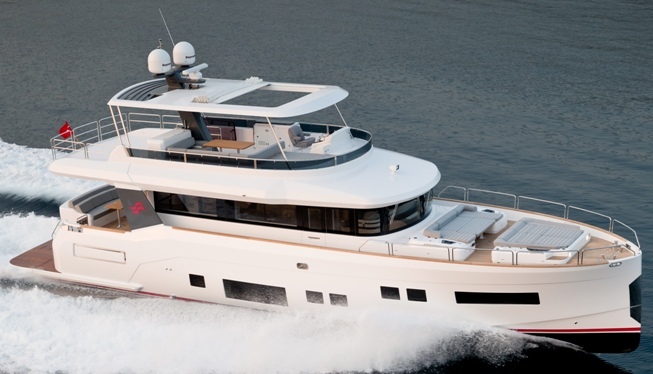 Sirena Yachts the all new Turkish motor-yacht brand part of Kiraca Holdings launches the new 64 at the 2017 Dusseldorf boat show. The Sirena 64 is to be followed by an eight feel smaller 56 model in just a couple of weeks launching at the coming Miami boat show. With this interesting explorer type yacht range, Sirena takes competition to the Azimut Magellano range head on with a very similar concept of yacht. The Sirena 64 is designed by Frers; hull and exterior lines, and Spadolini responsible for the interior. Her accommodation layout will offer three double guest cabins, plus a crew cabin with a two berth sleeping capacity. Standard power is from twin Cats 850hp engines which give a top speed up to 25 knots.